Some major movie theater chains announced they will not release weekend box office numbers for "The Dark Knight Rises" out of respect for the victims of the tragedy in Colorado. NBC's Ron Allen reports. 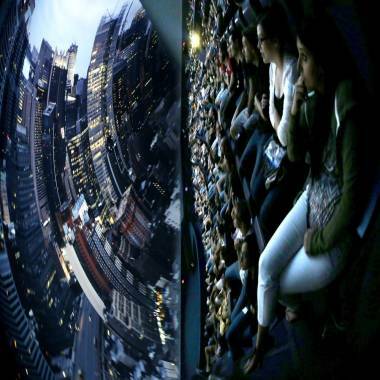 In this photo taken with a fisheye lens, an audience watches a late-night showing of "The Dark Knight Rises" inside the Liberty Science Center IMAX theater Friday in Jersey City, N.J. There was an unusual silence in Hollywood Saturday morning as studios refrained from officially releasing grosses for "The Dark Knight Rises" and other titles because of the shooting in a suburban Denver multiplex that left at least a dozen dead and dozens injured. But insiders with access to theater grosses say Christopher Nolan's final "Batman" pic easily topped the Friday box office with a gross in the $76 million to $77 million range — the third-best opening Friday of all time after "Harry Potter and the Deathly Hallows — Part 2" ($91.1 million) and "The Avengers" ($80.8 million). Both those films had the advantage of being released in 3-D.
Friday's gross includes $30.6 million in midnight grosses, the second-best midnight number of all time. Based on its opening day performance, "The Dark Knight Rises" appears headed for a $165 million to $170 million weekend unless business drops off dramatically. That would mark either the second-best or third-best opening weekend of all time after "Avengers" ($207.4 million) and "Deathly Hallows Part 2" ($169.2 million), and easily beats the $158 million debut of "The Dark Knight." Heading into the weekend, most thought "The Dark Knight Rises" would open in the $175 million to $185 million range. It's likely that the film lost some amount of business on Friday — and particularly during late-night shows — because of the theater shooting in Aurora, Colo. According to police, suspect James Eagan Holmes, now in custody, sported red hair and declared himself the Joker before opening fire during the midnight screening of "The Dark Knight Rises." "The Dark Knight Rises" — earning a glowing A CinemaScore — returns Christian Bale in the role of the caped crusader and introduces Tom Hardy, Anne Hathaway, Joseph Gordon-Levitt and Marion Cottilard to the franchise. Warner Brothers, who partnered with Legendary Pictures on "The Dark Knight Rises," announced Friday afternoon it wouldn't report weekend grosses out of respect for the victims of the shooting. By late evening, other Hollywood studios, along with independent distributors, said they would follow suit, at least on Saturday. Some studios may report numbers on Sunday.